An elegant, traditionally written novel about strange, strange things. Much like the ghost story, the post-apocalyptic story is a highly traditional form that’s difficult to wring surprises out of, but when done right–as this novel is–produces a pleasant sense of fright and unease, a feeling that the world’s familiar shape is both deeply contingent and menacing. 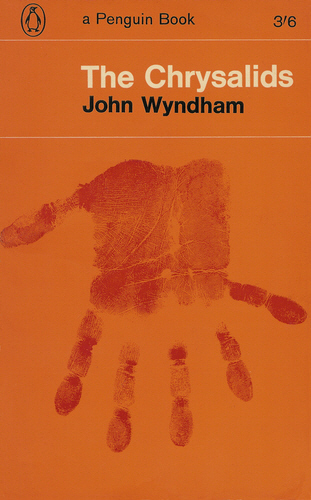 Like the ghost story, the fright of a good post-apocalyptic is best enjoyed in cozy surroundings, and Wyndham’s reliable, elegant prose helps create that mood for the reader. Parts of this book could have been written by Robert Louis Stevenson, and other parts read like J.G. Ballard writing for young adults. Vastly more sophisticated than the (highly enjoyable) Tripod books by John Christopher, and aimed at only a slightly older audience, this book is a masterpiece of young adult fiction. Posted in Uncategorized and tagged Chrysalids, John Wyndham, post-apocalyptic on March 9, 2012 by evanleatherwood.